Wrapping up the MSI Notebooks coverage, also on display at MSI’s suite were a couple of their latest mobile workstations. These are lower volume parts and basically take their consumer laptops and add in a Quadro GPU along with going through the required testing to be certified for use with NVIDIA’s Quadro GPUs. The two laptops shown are the WS60 (workstation version of the GS60) and the WT70 (workstation version of the GT70). 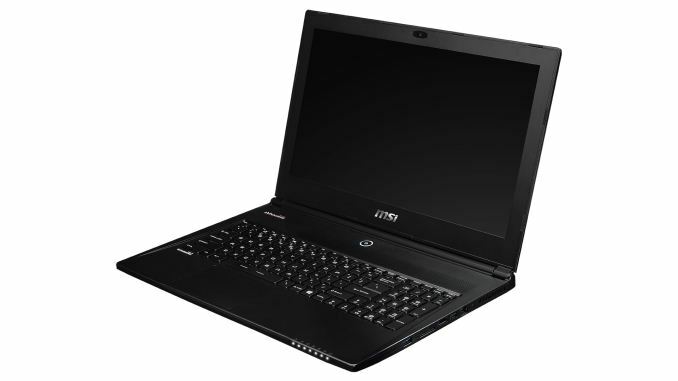 The mobile workstations feature some toned down styling, so the MSI Dragon Army and red highlights often found on MSI’s consumer laptops are gone, with a “Workstation” logo on the cover instead. Starting with the WS60, the CPU is the same i7-4710HQ found in the GS60, while the display is a 4K (3840x2160) IPS panel. HiDPI displays aren’t always the greatest depending on the apps you run, but for professional users and in particular those doing video editing, the native 4K support can prove useful. For the GPU, MSI supports the Quadro K2100M, a 576 CUDA core part that uses a GK106 Kepler core. Performance should be faster than the previous generation K2000M but not at the level of the K3000M, and the 667MHz core clock and 3000MHz GDDR5 clock are relatively tame. Still, the Quadro drivers enable enhanced performance in various professional OpenGL application as well as video and image editing software, which can greatly improve performance to the point where a K2100M outperforms even the fastest GTX 980M in such tasks. Moving on to the WT70, the core GT70 design and features are present, which means a single large cooling fan for both the CPU and GPU. GPU options include the Quadro K3100M and K4100M, and support for the K5100M also exists (though it sounds as though very few users are willing to pay the price for that GPU). As with the GT70, there’s support for up to three SSDs in RAID 0 with a 2.5” HDD bay for additional storage. Memory support goes up to 32GB, with the default configuration being 2x8GB of DDR3L RAM. The LCD also appears to be the same old 1080p TN panel used in the GT70, which is unfortunate but not surprising. An update with WT72 (GT72 for workstations) is sorely needed and is likely in the works. NVIDIA is also just about overdue for Maxwell based workstation class GPUs, so we will likely see those in the coming months. The workstation world for the most part is following in the footsteps of the desktop world; there will always be users that need the most performance they can get, but for many laptops have now become fast enough that the ability to take your system on the road is worth the added cost. As such, the mobile workstation market may be small, but it’s growing steadily and profit margins tend to be better than in the consumer sector. Currently, there are only a few mobile workstation options out there. Dell has their Precision line, HP has their ZBook line, and Lenovo has their W-series. Other than that, your choices are generally limited to system integrators using Clevo or MSI based platforms. MSI has definitely made some marked improvements in their consumer notebook designs lately, and it will be great to see workstation options of these in the future.